I have stumbled upon a chicken secret that I have found to be quite magnificent. Did you know that cooking a roast chicken upside-down creates the most succulent breast meat ever? Better yet, this recipe cooks a whole roast in a fraction of the time too! One night while my husband and little one were fast asleep, I lay awake in the living room enjoying some mommy time. I was flipping through the channel guide and happened to notice an episode of “I’ll have what Phil’s having” on PBS. I was stopped in my tracks because he was eating his way through Paris with the ever-popular and amazing food blogger and cookbook author David Lebovitz. David took him to the most incredible pastry shop in all of Paris. On one of his last stops, he dined at Chez L’Ami Louis, which is known for having the best roasted chicken in all of Paris. Roasted chicken is a sacred national dish in France, so I KNEW this had to be good! And duck fat, chicken fat, or butter is all you need to make the only roasted chicken (or turkey!) recipe you’ll ever need. But the technique itself is just as important. The secret to the best roasted chicken was simple. Start with a REALLY hot oven, and bake the chicken UPSIDE DOWN in a cast iron skillet or ceramic pan (like a Le Creuset) basted with duck fat. Cooking the chicken upside down protects the breast from drying out because the fattier dark meat is basting the breast the entire time and it’s not exposed to direct oven heat. The recipe also called for goose fat, but that’s harder to come by so I just used duck fat. Chicken fat, bacon fat, or butter would also be a great substitute because the cooking technique itself is what really matters. Won’t the breast meat dry out at such a high temperature? When you scour Google for the best temperatures to roast a chicken, you’ll often find people suggesting to roast it at 450 degrees for only 10-15 to start browning the skin, then drop the temperature to 350-375 degrees for the rest of the cooking time. This is great advice if you’re roasting your chicken breast-side-up. But because the chicken breast meat is cocooned under the dark meat upside down, you can really push the oven temperature to a higher setting. If this weren’t true, why would one of the most famous roast chicken restaurants in all of Paris (where roast chicken is a national treasure) bother cooking all of their roast chickens at this temperature?! Alrighty, let’s get to the roasting technique. 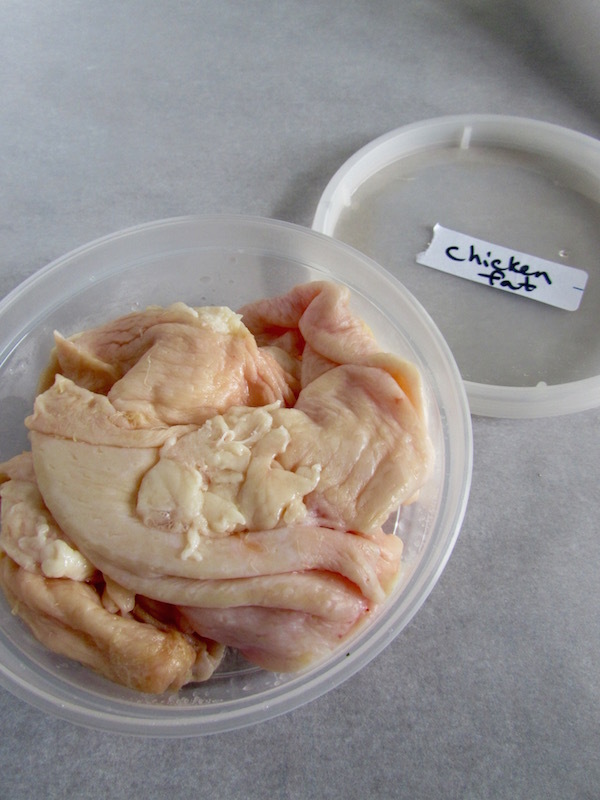 Below is what the chicken looks like breast-side-down. Next is a photo of what it looks like out of the oven, breast-side-down again. You can see that you get plenty of crispy skin on the bottom! Then I turned it over and popped it under the broiler for 3-5 minutes to get some caramelization on the breast meat. Don’t walk away at this point because you could easily burn the skin! Again, here are links for the duck fat I used, and an awesome cast iron skillet. If you need some more amazing cast iron skillet recipes, my Poblano and Cheddar Cornbread is pretty stellar! This roasted chicken recipe is adapted from a legendary bistro in Paris known for having the best roast chicken in all of France! Preheat the oven to 450 degrees and place a rack in the middle position. Put the cast iron skillet on the rack to preheat as well. This will help to get a nice crust to form on the breast. Rinse the chicken and check the cavity for the neck and gizzards. You may keep them in the cavity (be sure to remove any packaging) for added flavor to the bird or you can freeze them and use to make gravy. Dry the chicken with paper towels really well. Place a half of one lemon and a few thyme rosemary sprigs in the cavity and season the entire bird with salt and pepper and sprinkle with fresh thyme. Rub the bird with duck fat, chicken fat, bacon fat, or butter. Place the bird upside down (breast-side-down) in the hot cast iron skillet or heavy duty oven-safe ceramic pan. If there is any room in the pan, you can roast whole carrots or quartered onions too! Bake breast side down until the thermometer reaches 150 degrees F. It's best to remove the skillet and turn the bird over to insert the thermometer in the breast to check the temperature. When the bird reaches 150 degrees F, turn the chicken over and turn on the broiler breast-side-up. Let broil 3-5 minutes to help the skin on the breast to crisp. As an option, right before flipping the bird to breast-side-up, you can remove the chicken and the carrots from the skillet and pour the juices in a saucepan so that the bottom of the bird stays crispy. You can simmer the juices for a couple of minutes to ensure they are cooked through. Serve on the side of the chicken. Once the chicken is under the broiler DON'T WALK AWAY, it can easily burn. It should take 3-5 minutes. Remove the chicken from the skillet and let it rest for at least 10 minutes before carving.